Even though it is difficult to recommend anything due to the many options and the wide-flung distribution of the sites, I personally would not miss the second edition of Behind the Wall, whose chief curator, Juan Delgado Calzadilla (Juanito) announced the inclusion of 50 different projects by artists—not only visual, but musicians, writers and actors as well—from various countries, who will be occupying a part of the Malecón and areas across the avenue. The exhibition area will be open from 5pm, May 24 until June 22, when the Biennial will officially be closed. Apart from the always attractive presence of artists like Manuel Mendive and Roberto Fabelo, I’m sure that the ice rink that New York artist Duke Riley plans to set up on the corner of Malecón and Belascoaín Street will get the prize for popularity. The 200 pairs of skates that Riley will be bringing to Havana will be precious few given the number of children and adults eager to make their debut in a winter sport under the scorching Cuban sun. Other actions not to miss include the nondiscriminatory, inclusive project Entre, dentro, fuera / Between, Inside, Outside, at the Pabellón Cuba; the performances at El Ciervo Encantado; and the presence of one of the main representatives of Arte Povera, the Italian painter, action and object artist Michelangelo Pistoletto. He will be offering a lecture at the University of the Arts (ISA) on May 21 at 11:30 am, as well as two performances: Tercer Paraíso (Plaza de la Catedral, May 23, 4pm) and Thirteen Less Two, with the Ars Longa Early Music Ensemble (Iglesia de Paula, May 24, 11 am). A conceptualist “invasion” has been predicted by the Uruguayan Luis Camnitzer: the exhibition Ejercicios, opening at 6pm, May 20 at the Casa de las Américas, The French artist Daniel Buren, who is best known for his “stripes,” will take part in the art actions in Casablanca, will make interventions on doors on San Lázaro Street and will deliver a lecture at ISA at 2 pm, May 21. Meanwhile, Joseph Kosuth will also lecture at ISA on the same day at 9:30 am and will be exhibiting at the National Library at 4:30 pm, May 24. 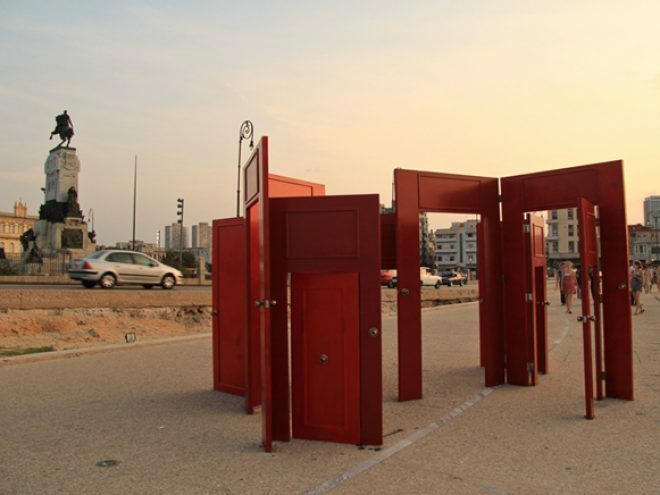 Starting at 10 am, May 22, an interesting group of Cuban and international artists will be livening up the peaceful streets of Casablanca to dream and create art along with its inhabitants. As in previous years, Old Havana promises to be a truly privileged place for art. In addition to the many actions that will be taking place at the Wifredo Lam Contemporary Art Center, Factoría Habana or the Center for the Development of Visual Arts, numerous and diverse projects will be taking over the streets and buildings. Joining in its hectic pace, sharing the boisterous extroversion of its inhabitants and letting yourself be taken by surprise by performances, itinerant projects, projections on walls, can all be an attractive and even mind-blowing experience. On the other side of the bay, the Morro-Cabaña complex will host Zona franca, the collateral exhibition space showcasing Cuban contemporary art of the past five years. Painting, sculpture, drawing, photography, installation, design or video art in around 100 solo and group shows by acclaimed artists, as well as young artists who will be bringing their aesthetics and new ways of doing and interacting with the viewers, will occupy the vast area of the colonial fortress to attest to the complexity and richness of current art creation on the island. So I recommend you start getting ready for the Biennale with comfortable walking shoes, a broad-brimmed hat, plenty of drinking water, and, above all, eyes wide open.